What Can I Do About Intermittent claudication? 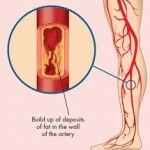 Claudication is caused by clogging arteries. If you have the symptoms described in our Intermittent Claudication Info Sheet, see your GP to manage the condition. You need good control of your body weight, blood sugar, blood fats / cholesterol and blood pressure. Ultimately some surgery may be necessary, either by insertion of a stent or an arterial graft. Take care to avoid injury that may be difficult to heal due to limited blood Supply to the feet and legs. For example, move furniture so that you won’t bark your shins on it in the night. Importantly, keep walking up to the point of pain as often as possible. This will help to maintain blood flow and stop the problem from worsening. When your body experiences this pain, it is more likely to try to construct alternate ways to flow past the narrowed area. See a podiatrist to have your foot blood flow assessed using a Doppler ultrasound.